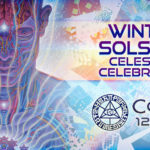 Equinox and Solstice celebrations at CoSM honor polarities and the alignment of the earth with the sun, crests and troughs in the wave of time -- the longest and shortest days and nights of the year and the two days of balance and equivalence. The celebration of Halloween was born out of the pagan holy day, Samhain, which is a cross-quater day. Cross-quarter days fall halfway between the equinoxes and solstices. When we notice the passing of the days, the months, the years, we contemplate impermanence, raising our awareness to the preciousness of life in the here and now. 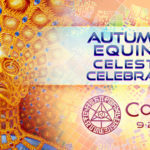 At CoSM, Celestial Celebrations begin with spoken wisdom on a worthy topic. 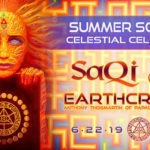 Speakers have included Graham Hancock, Paul Stamets, and Julia Butterfly Hill. After the talk and discussion, the audience breaks. 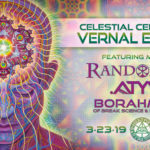 Then, look forward to some of the best electronic music, down tempo music, ecstatic dance, a fire circle, and fire spinning. Alex and Allyson live paint along with a showcase of visionary artists Into the wee hours of morning. 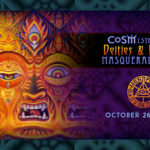 Acrobats, belly dancers, laser light shows, taro readers, palmists, face painters, group sand mandalas have all been part of the rich tapestry, the transformative tableau of uplifting offerings at CoSM Celestial Celebrations.